the Harmons Best Dam Bike Ride in Logan, Utah. Logan, UT – This year, 2,200 cyclists pedaled through Cache Valley and into southern Idaho to raise $1.4 million that will support a world free of multiple sclerosis. The event is the 28th annual Bike MS: Harmons Best Dam Bike Ride presented by the National Multiple Sclerosis Society Utah-Southern Idaho Chapter, June 28-29. 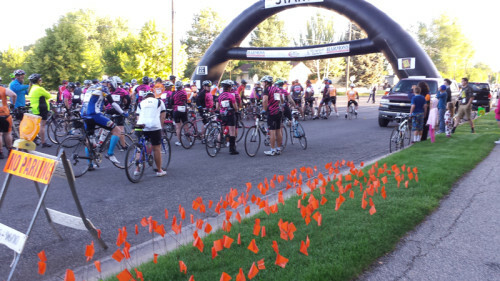 The annual ride helps raise funds that support research for a cure and local programs and services for Utahns and Idahoans impacted by MS.
“It was a successful BikeMS year, and we urge everyone to plan on participating again in 2015. Much gratitude and appreciation to all of our cyclists and volunteers who worked together to raise funds for MS in our communities,” said Becky Lyttle, vice president of community development for the Utah-Southern Idaho MS Chapter. For more information, visit bikemsutah.org.